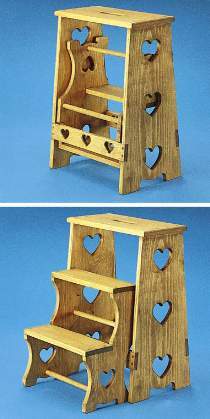 This dual purpose stool provides a seat for kitchen chores or an easy way to reach high cupboards. Steps tuck up out of the way or fold down with a single easy motion. Cutout in top makes a convenient carrying handle. FULL SIZE patterns. Project measures 24-3/4"H x 20-5/8"W.